Despite worries about his country’s dependence on Chinese largesse, Jacob Zuma signs some major deals on a recent visit. Late last week, South African President Jacob Zuma was in China on his second state visit to the country since 2010. Welcoming Zuma on his arrival, Chinese President Xi Jinping called him “the Chinese people’s old friend and good friend.” The meeting came months after the South African government declined a visa to the Dalai Lama, who was scheduled to attend the World Summit of Nobel Peace Laureates in Cape Town from October 13 to 15. This was not the first time Pretoria has taken such a step – thrice previously, it has found excuses to decline visas to the Dalai Lama. The rejection this time prompted a significant backlash, with dozens of Nobel laureates boycotting the summit in protest, and fellow laureate Desmond Tutu criticizing the government for its actions. The payoff for South Africa, though, has come in a number of immensely significant agreements, among them three nuclear pacts. South Africa is planning to install 9,600 megawatts of nuclear energy by 2030. China Guangdong Nuclear Power Holding Corp., Russia’s Rostaom Corp, and France’s Areva SA, are among the companies that are vying for contracts to bid for the rights to build atomic plants in South Africa. On November 7, Pretoria and Beijing inked a nuclear cooperation agreement, which was a precursor of sorts to those signed on December 4. These include a nuclear project financing framework between China’s Nuclear Power Technology Corp., Industrial & Commercial Bank of China Ltd. and Standard Bank Group Ltd. Two Chinese universities have also agreed to provide South African manpower with the requisite nuclear training. Agreements have also been signed in sectors spanning manufacturing, aviation and finance. In talks between Chinese Premier Li Keqiang and Zuma, the premier said that China would make South Africa a priority destination for overseas investment. China will also continue to work closely with African countries to fight the ongoing Ebola epidemic. The agreements are significant, but not all that surprising, given the historical context. The two countries have a long economic and political history. China is South Africa’s single largest trading partner, while South Africa is China’s largest trading partner on the continent. In 2011, South Africa joined the BRICS bloc of developing economies with Brazil, Russia, India and China. Its foreign policy has, likewise, maintained a strongly pro-China orientation for many years. However, relations have encountered some rough weather of late. China’s influence in Africa has been a topic that has split public opinion down the middle right across the continent. In South Africa, a 2014 survey by the Pew Research Center found that while 45 percent have a favorable image of China, 40 percent do not. South Africans are equally tightly divided over the question of whether Chinese economic growth is good for the country, with 41 percent in favor of Beijing’s influence. Indeed, South Africa has been rather vocal about its concerns about just how far it is willing to let Beijing go. Competition from cheap Chinese imports has been hard on domestic firms, and Zuma is on record himself as saying in 2012 that Africa’s lopsided trade relationship with China is “unsustainable in the long term.” The concern is somewhat justified: South Africa has a $4 billion trade deficit with China, and its economy has struggled for growth. China’s preferred modus operandi in terms of trade, where it extracts raw material and natural resources from Africa and injects its own manufactured goods in return, does not and has not helped to allay the worries. Cultural influence from Beijing is another fear shared by many South Africans. A Pew survey, this time in 2013, highlights the fact that 60 percent of South Africans dislike the idea of Chinese music, movies and television infiltrating their country. There have been concerns about Chinese investment in South African media outlets, and Zuma’s own party – the African National Congress – has been accused of receiving political funding from the Chinese Communist Party. These concerns aside, it appears that Pretoria is, not unnaturally, putting national interest above public opinion. Beijing is a well-heeled customer, and the lure of the scale of investments, grant aid, and infrastructural aid that it could provide is too tempting to resist. A case in point – South Africa has a lone nuclear plant, is plagued by electricity blackouts and is seeking to reduce its hitherto heavy reliance on coal-fired power stations. A continued under-investment in power generation has led to sharp constraints on electricity, and this is being blamed for limiting economic growth and productivity. Small wonder, then, that Pretoria is doing all it can to attract Beijing’s interest. In 2014, it unveiled a new initiative to add Mandarin Chinese to school curricula, as part of an educational agreement between China and South Africa. This is in line with Beijing’s own change in policy orientation. The new leadership in China is seeking to shift investment in Africa towards financing infrastructure, agriculture and manufacturing, rather than focusing on its traditionally heavy investment in natural resource extraction. Beijing’s activities in Africa have long been dogged by accusations of colonialism, and Xi Jinping’s tour of Africa last year was a paradigm shift away from a policy dominated by pure economics. 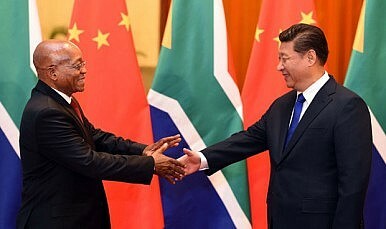 To that end, the ruling Chinese Communist Party-run Global Times, in an article last year, quoted Xi as telling a meeting of African leaders in Durban that China would actively participate in the mediation and solving of hotspot issues in Africa, besides encouraging Chinese enterprises to expand their investments in Africa. This suggests that Beijing is looking beyond the traditional boundaries of resource diplomacy and is aspiring to increase its strategic presence through enhanced political, economic and diplomatic resources. Jacob Zuma’s government has come under heavy criticism from fellow South Africans for following a policy trend that has been termed as “kowtowing” to China. But the larger question here is – can South Africa afford to ignore China’s money? Narayani Basu is a freelance journalist, with a special interest in Chinese foreign policy, East Asian regional security, and resource diplomacy in Africa and Antarctica. A closer look at the state of ties between the two countries.